Ever wonder what it’s like behind the scenes of a fantastic sweets factory? 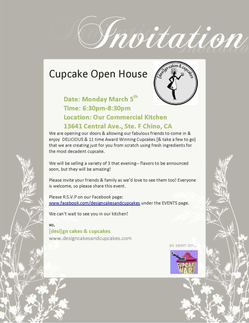 Well, you’ll get your chance to check out an award-winning bakery on Monday (March 5) as our friends over at [desi]gn cakes & cupcakes open their doors for an open house. And you don’t even need a golden ticket. The bakery typically just does event catering, special event tastings and online sales of its cupcakes in a jar, so the open house will be a treat (pun intended) for those of us who have wanted to sample their wares. The cupcake menu is still being decided, but one flavor that will definitely be available for purchase is the one they debuted at the L.A. Cupcake Challenge this year: Buffalo chicken! The much–talked–about savory cake is made with polenta, ranch cream cheese, boneless chicken and Buffalo sauce. The open house will take place from 6:30 to 8:30 p.m. at their commercial bakery at 13641 Central Ave., Suite F, in Chino. For more information, or to vote for a favorite cupcake flavor, head the open house’s Facebook event page. Update: Three flavors will be for sale — Churro and the above-mentioned Buffalo chicken, both featured at the L.A. Cupcake Challenge, and banana cream pie. Our friends over at I.E. Gourmet Food Trucks are on a roll! They haven’t even held their first event yet (it’s tomorrow night in Corona, by the way) and already they’ve announced another event. The new event is a fundraiser for the Norco High School Booster Club. The free event will be held from 5 to 9 p.m. March 7 at Norco High School, 2065 Temescal Ave., Norco. The Coffee Bean & Tea Leaf is hosting an open house from 2 to 5 p.m. today (February 28). A 12-ounce Wild Cherry Fru-Tea or hot or cold Wild Cherry Tea Latte will set you back only $1 during the event. The offer is only valid at participating Coffee Bean & Tea Leaf locations, not including Ralphs or airport stores. Inland Empire Coffee Bean & Tea Leaf locations include Redlands, Fontana, Rancho Cucamonga, Claremont, Chino Hills, Riverside, Lake Elsinore, Temecula, Palm Springs, La Quinta, Palm Desert and Indio. Been curious about the the upscale Ra Pour Restaurant and Lounge, but have been hesitant to give it a try because you were afraid to splurge a little? You’ve got a little less than 12 hours left to take advantage of a pretty amazing Groupon deal. The best part? Two can save, but four save more. Lunch for two, with an appetizer and two entres, is only $25. Dinner for two, with an appetizer and two entres, is only $45. Dinner for four, with two appetizers and four entres, is only $75. Those are outstanding deals, with savings of up to $30 off the lunch deal, up to $46 off the couple’s dinner deal, and up to $107 off the dinner for four. Wow! Needless to say, I’ve already taken advantage of the deal. This has not been a good time to be a Denny’s in San Bernardino. As foretold to me by a Dine 909er (thanks, Sue! ), the south San Bernardino Denny’s at 1185 Rosewood Drive has gone the way of its old school brethren on Orange Show Road. The location closed February 12. That marks the second San Bernardino Denny’s to close in just a few short months. This location, however, closed to make room for progress. In this case, a Caltrans project. A new on-ramp will cut right through Denny’s old parking lot. Now “only” two San Bernardino Denny’s remain: Highland Avenue (at Valencia Avenue) and Palm Avenue (at I-215). This year marks the seventh consecutive year that the International House of Pancakes will hold a pancake fundraiser for Children’s Miracle Network Hospitals. Here’s how it works: Head on down to your local participating IHOP between 7 a.m. and 10 p.m. Tuesday (February 28) and you’ll receive a free short stack of buttermilk pancakes. Guests are asked to make a voluntary donation for Children’s Miracle Network Hospitals in exchange for the pancakes. During last year’s fundraiser, IHOP served four million free pancakes and pancake lovers donated more than $2.5 million to children’s charities, exceeding the fundraising goal of $2.3 million. It was the largest one-day event in IHOP’s 53-year history. This year’s goal is $2.7 million, which would bring the total raised in the campaign to more than $10 million. IHOP locations can be found throughout the Inland Empire, including San Bernardino, Rancho Cucamonga, Redlands, Ontario, Fontana, Highland, Upland, Chino, Riverside and Moreno Valley. For more information, head to IHOP’s Pancake Day website, where you can donate online or get a reminder wake-up call from such celebrities as Jordin Sparks, John Schneider, Steve Young or Marie Osmond. 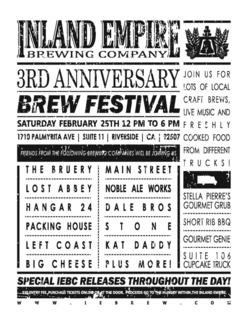 Inland Empire Brewing Company in Riverside will be celebrating its third year in business this Saturday (February 25). The brewery is bringing in other I.E. breweries (Hangar 24 Craft Brewery, Dale Bros. Brewery, Packinghouse Brewing Co., Big Cheese Pizza and Brewery, Main Street Brewery, Craft Brewing Co. , Taps Fish House and Brewery and Kat Daddy) and breweries from beyond the I.E. (Stone Brewing Co., The Bruery, Lost Abbey, Noble Ale Works, Left Coast Brewery and Bootlegger’s Brewery) to help celebrate. Throw in a few food trucks (Short Rib BBQ, Gourmet Genie and the I.E.’s own Stella Pierre’s Gourmet Grub and Suite 106 Cupcakery) and you’ve got yourself a party. A $30 entry fee includes 15 beer samples from the participating breweries. Proceeds will help feed the hungry here in the Inland Empire. Designated drivers and other non-drinkers can attend for free. The event will take place from noon to 6 p.m. Tickets are available online or at the door. Inland Empire Brewing Company is at 1710 Palmyrita Ave., Suite 11, in Riverside. Our friends over at I.E. Gourmet Food Trucks have put together their very first food truck event. The Corona Chamber of Commerce Prime Time Mixer will take place from 4:30 to 8:30 p.m. next Wednesday (February 29) at the UFC Gym, 470 N. McKinley St., Corona. Trucks scheduled to participate include Bacon MANia, the Lime Truck, Pogi Boy, Dos Chinos, Crepe’n Around, and the Slummin’ Gourmet, according to the event flier. Also, Cafe2U will debut its new truck. For information, visit I.E. Gourmet Food Trucks’ website. Today (February 22) is George Washington’s birthday and everyone has heard the apocryphal story of his honesty regarding the chopping down of a certain cherry tree. (And yet another president got the nickname of “Honest”…hmm). In honor of the “father of our country” (and Baker’s Drive-Thru’s 60th anniversary, of course), the fast-food chain is offering its Facebook fans (and others) a cherry milkshake for only 60¢ with a coupon. As with all Baker’s deals, you can either print the coupon or show it on your mobile device. One milkshake deal per coupon and one coupon per person or per car. The deal is good today only. Baker’s Drive-Thru locations can be found throughout the Inland Empire. Great food close to home, right? 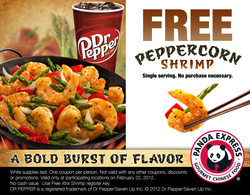 Happened to stumble upon this coupon for free Peppercorn Shrimp at Panda Express. The free single-serving entre is good today (February 22) only at participating locations. Panda Express locations can be found throughout the Inland Empire.